A friend of ours just recently had a little baby girl. I jumped on the opportunity to indulge in a pink project. 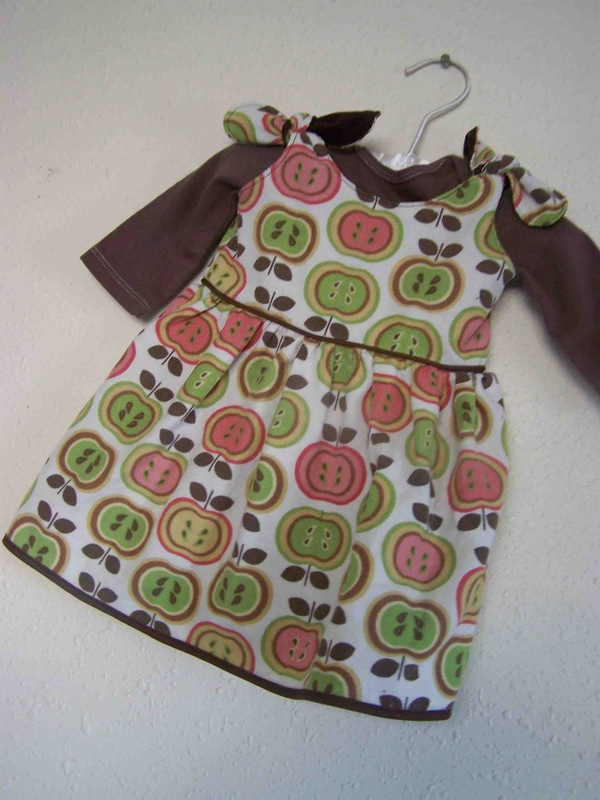 I found this adorable apple corduroy at Joann's and thought that it would make a fun autumn dress for the new little lady. I used Rae's free Itty Bitty Baby Dress pattern. Because this would be a winter baby, I thought that I'd have to make some coordinating long sleeve onesies to go with the little dress. I used Rit dyes to color a couple of packs of onesies. I experimented with a couple of dyes to get a range of colors. 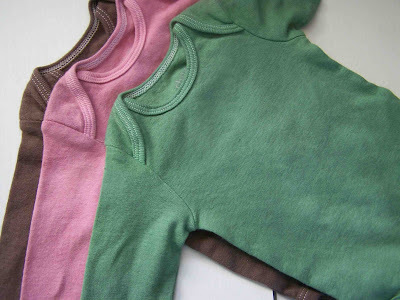 I have some green onesies on hand for a couple of little boys that are on their way. I also whipped up a pair of these baby booties to go with the new dress. I had intended on making a pair of ruffle bum leggings, but my sewing machine is on the fritz. I might have to send them off later. oh what a lovely little package of gifts! does it make you wish you had a little girl? i love the sweet dress and the booties especially. goodness they are cute!! Adorable!!! I love that fabric, it catches my eye every time I go to Joann! Adorable!!! 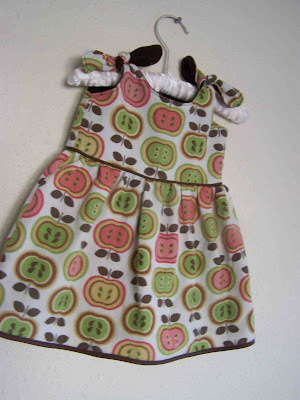 I love the fabric (and I LOVE corduroy dresses on little girls). How was the itty bitty baby dress pattern? I keep meaning to make one of those for my cousin's baby... but I'm not very good at sewing clothes! :) It's on my to do list! Perfect outfits! I love the colors of the onesie. I was also eyeing that fabric at Joann's. Too bad I'm not having a girl! These are so cute! I love those booties! And thanks for the link to the dress pattern. What a lucky little girl! 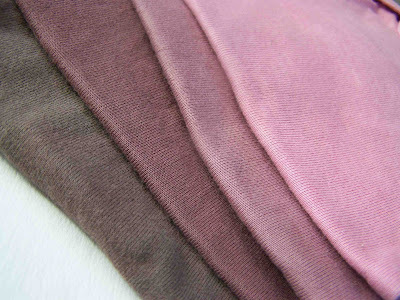 Love the apple corduroy. And I adore the colors you chose to die the onesies... perfect! 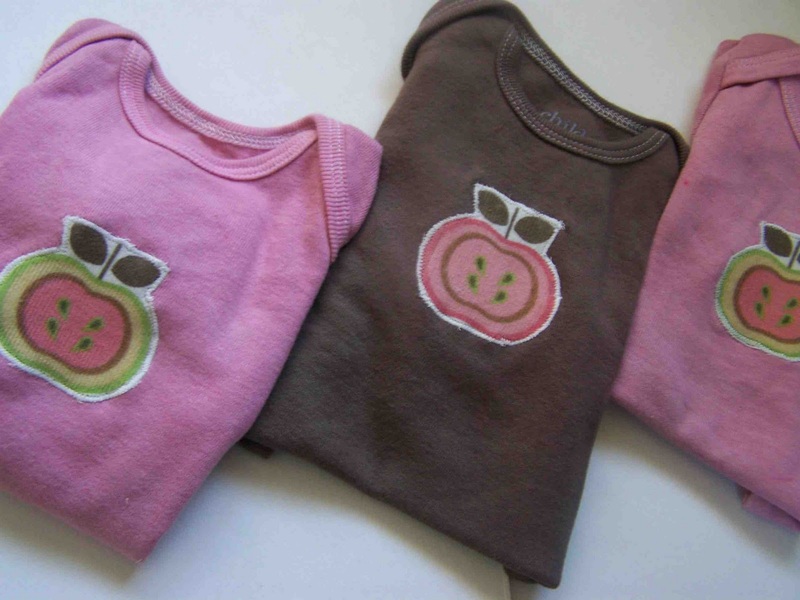 The appliqued apples are a sweet touch. And those booties look store-bought... amazing work! Super cute!! I just bought some of this fabric last week to make a skirt for my daughter! 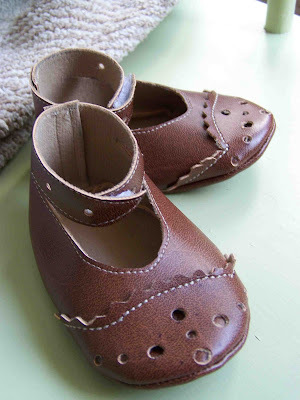 Love those appliques too, what a great idea!! How on earth did you do those booties? I thought they were store bought till I read a little farther!! I'm your newest follower visiting from Whatever Goes Wednesday. Too cute! I'm almost jealous I don't have a baby girl to dress! The new mommy will love them. I'm visiting with TRH, hope you visit me too! Absolutely adorable. It makes me want to have another baby girl just to put her in something this cute! How sweet! I made an Itty Bitty dress this week too! I can't choose which one I love most : the itty bitty dress, onesies & booties, they're all soooo cute !! Love it! What new Mommy wouldn't love that outfit to parade her new girl around town. 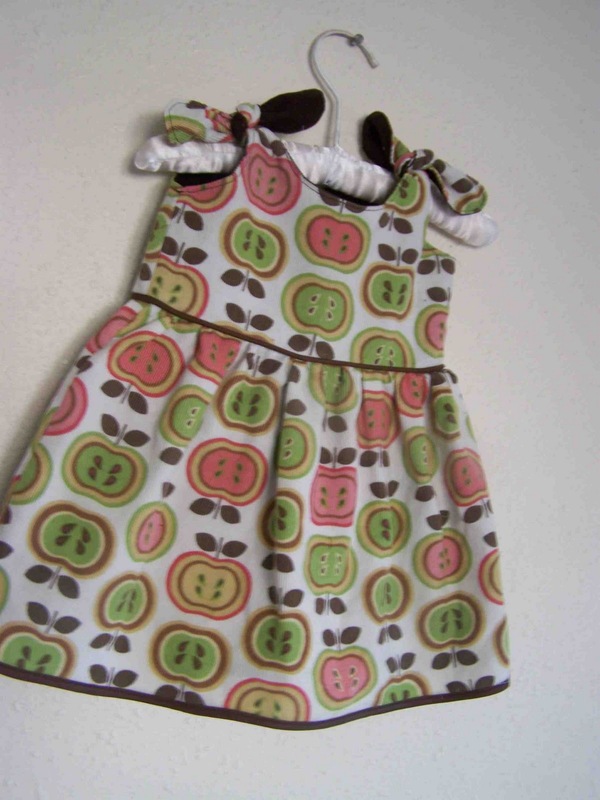 I love the apple print, so cute! Great job. How cute, I love the color combinations. Great job! Apples are very apt for autumn, great choice! Very generous to include a top and make shoes as well, georgeous outfit.